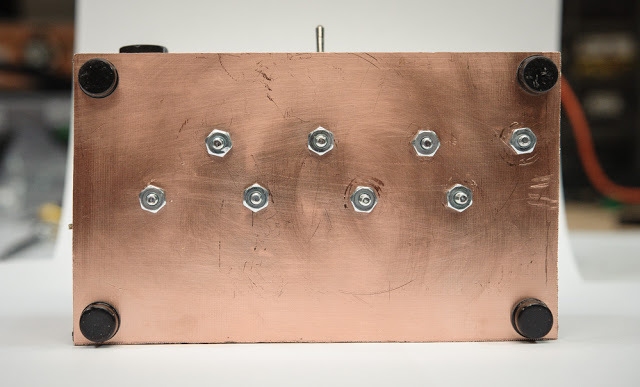 I crafted my heat sink from MG Chemicals Copper Clad Board, Double Sided, 1 oz Copper, 1/16″ thick, FR4. My entire chassis serves as the heat sink. 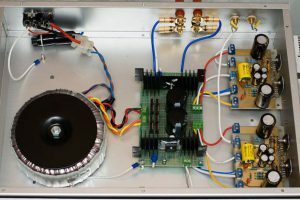 I come from an RF background and we builders use double sided board for enclosures, heat sinks, shields, and of course, for our circuit boards. I employed a clumsy 80W soldering iron to solder my boards together. Above — Project schematic. My switch rating = 6A at 225 VAC. I opted to use a standard 1/4 inch speaker jack as the input. I connect it to my power amps under test via a short home brew patch cable. 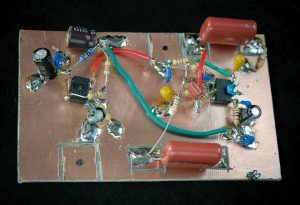 Above — Front view of my dummy load. Above —Side view. 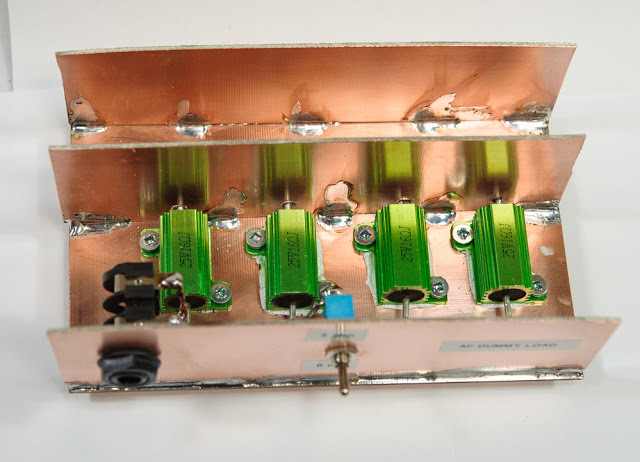 Each power resistor’s ground wire passes through a hole drilled in a double sided Cu clad “vertical fin” board. 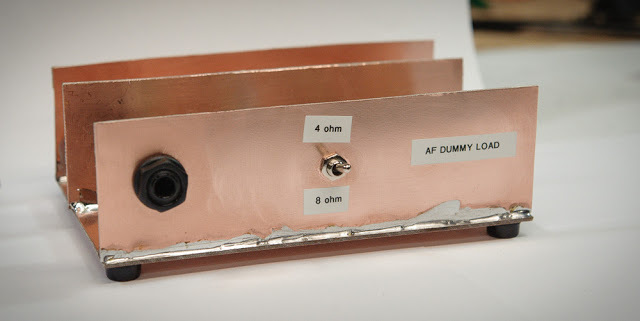 The tip of each ground wire was bent flush against the copper fin board and soldered. 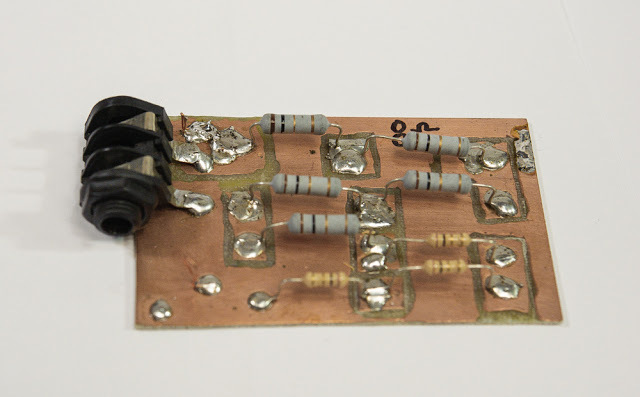 The copper fin board is soldered to the main board on both sides providing a low impedance ground, plus some heat sinking. You can’t well see it but I completely soldered the grounded resistor side of the copper fin board to the main board. The input side of the power resistors connects to the input jack and switch via bare, solid core 22 gauge wire that’s folded in half, twisted and then soldered together. Above —Above, oblique view. You can see the vertical, ground wire “fin” copper board and a secondary vertical fin Cu board behind it for added heat sinking. Above — I applied thermal grease to the bottom of each aluminum power resistor enclosure before bolting them down. 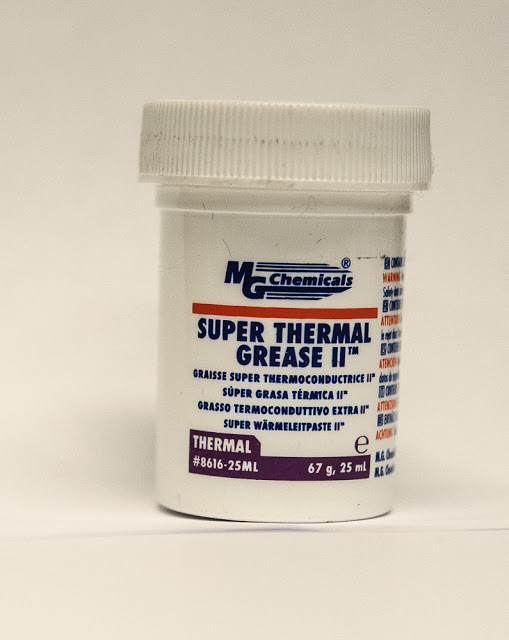 I’ve enjoyed good results with MG Chemicals’ super thermal grease II in many previous projects. Wear gloves and lay out some paper to prevent a messy bench + greasy hands. Above —Bottom of main Cu board. 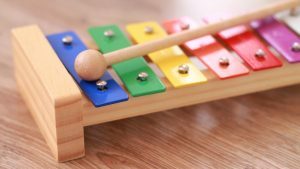 The 2-sided board provides reasonable heat sinking, plus mechanical strength. The nuts and bolts connect the top and bottom board sides at DC & @ AC out to High Frequency. I placed 4 stick-on rubber feet for a sturdy base. 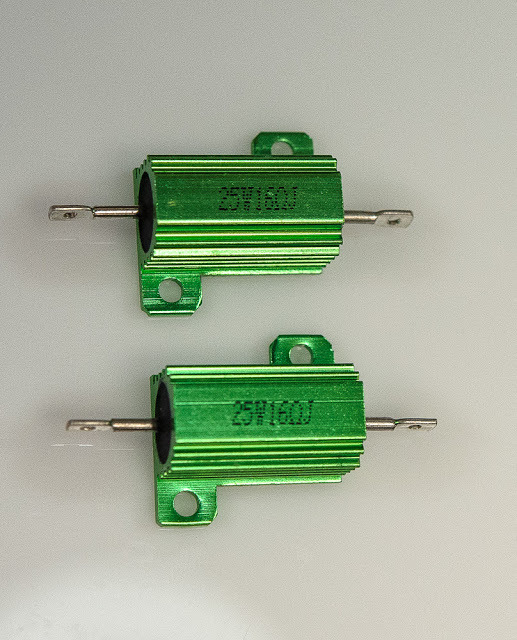 Above — The holes in my green power resistor aluminum enclosures were big enough (3.5mm/0.14inch) to allow the use of 6-32 hardware — you can really bolt them down securely to your heat sink. Above — Close up photos of my particular power resistors. 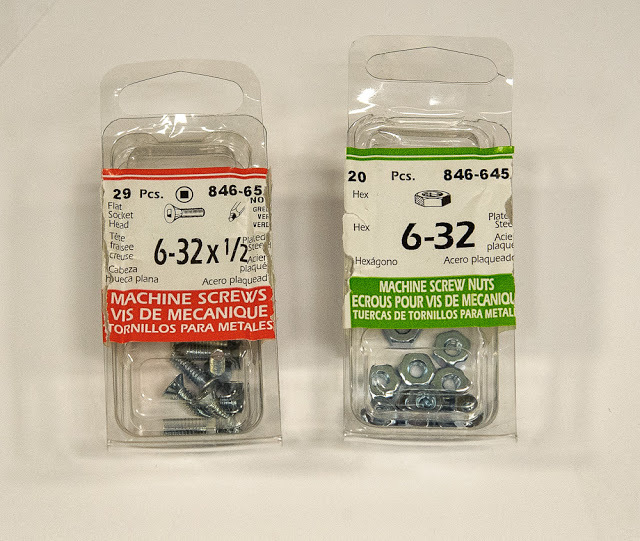 I purchased them for $2.59 CAD each including shipping and handling. Quite reasonable. With a strong RF background, the term ‘wire wound resistor’ strikes a bit of fear in my heart. I measured my resistor’s inductance, plus swept 1 in a tracking generator + spectrum analyzer from ~ 9Khz to 1.3 GHz. Typical inductance of the couple of resistors I tested from my batch= 889 nanoHenries. My sweep revealed that the series resonant frequency (SRF) of 1 of my batch of resistors = ~ 109 MHz. The notch @ ~ 109 MHz isn’t very deep; it’s around 14 dB down from reference. This fits with my lab experiences. I keep a good selection of wire wound chip inductors for building circuits in the 100 – 1200 MHz region. Every chip inductor I own has been swept and characterized — I keep a high Q, Coilcraft, wire wound, 880nH, size 0603, SMT inductor and its SRF = 104 MHz. In truth, a chip inductor & a power resistor compare poorly, but give the chip inductor gives a ballpark SRF reference of what to expect. Of course, the SRF notch of my high Q SMT part is ~44 dB deeper than a lousy 16 Ω power resistor. 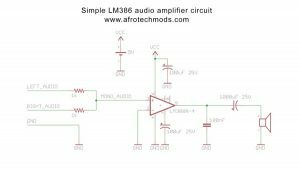 Since the power resistor is low in resistance (and will go in parallel with other 16 Ω resistors), its a low Q inductor — and with a SRF above 100 MHz, it will work fine as an AF power resistor. Above — My 16 Ω resistors tolerance = 5%. With all 4 resistors in parallel I measured 4.28 Ω at room temperature with my DVM in high resolution mode. 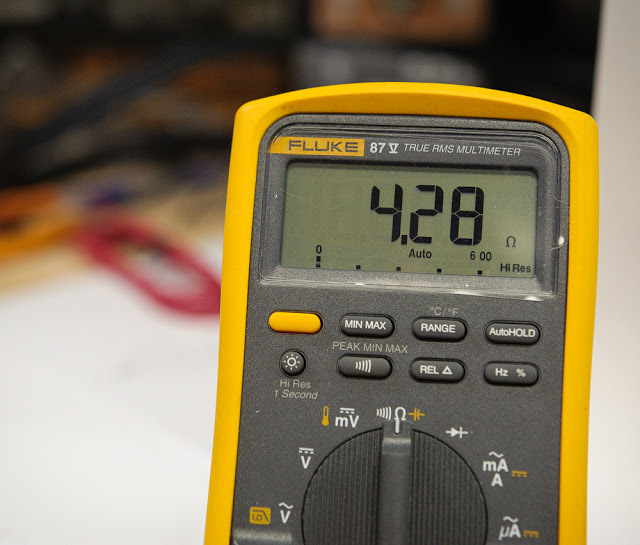 With the resistors at 48.9 degrees Celsius, my DVM measured 4.29 Ω, I will use 4.28 Ω as my “4 ohm” resistor value in all amplifier power calculations based on bench measures. Above — With 2 resistors in parallel I measured 8.29 Ω and this rose to 8.3 Ω when the resistor’s temperature rose to 50.6 Celsius. Resistor temperature coefficient =100 PPM / C . I’ll use 8.29 Ω as my resistance when calculating power from measures made on the bench. 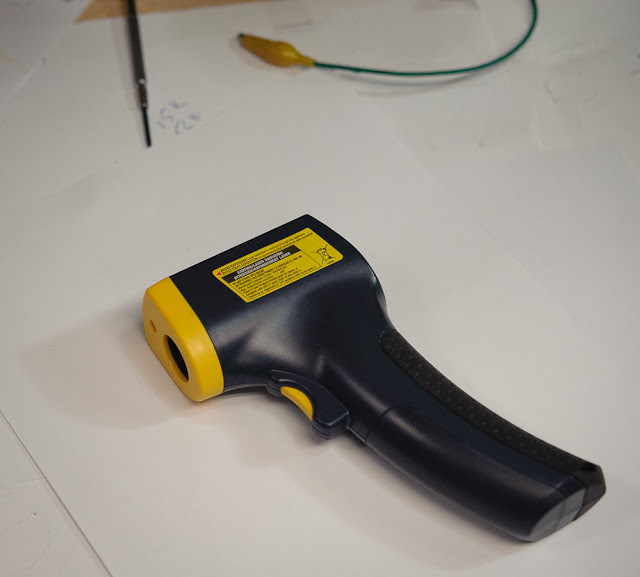 Above — An infrared temperature monitor proves invaluable for bench temperature measures. I measure the temp of my power resistors — and also project AF and RF final transistors temperature with this device. 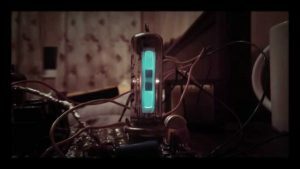 I put my switch in the 8 Ω setting and ran a 1KHz signal generator into a small power amp with the dummy load connected. 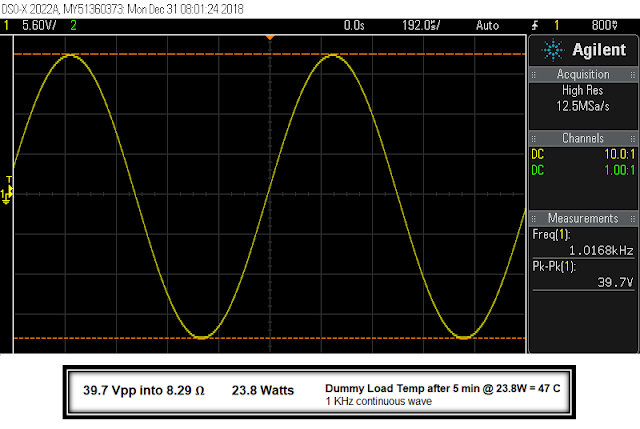 I set a measured 15W output power and let it run for 15 minutes unattended to heat up my dummy load. After 15 minutes, the peak temperature on the 2 power resistors in parallel = 50.6 C. This seemed @ steady state, as the temperature did not rise above 50.6 C.
Then I switched to the 4 Ω setting, drove the load for 15 W measured power and let it run for another 10 minutes or so . The peak temperature measuring on top of the resistors was 46.5 C. Distributed across the 4 resistors, my dummy load ran cooler than with the same output power into 8.29 Ω paralleled pair. All as expected. 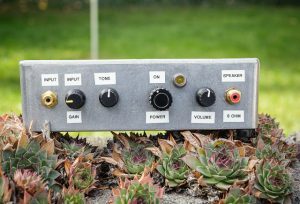 During normal bench measurements of power, or when setting the bias on a tube amp; or adjusting the trimmer potentiometer to set DC voltage for the VBE multiplier on a solid state PA, it probably only takes < 5 minutes. Thus a continuous 1 KHz wave @15W for 15 – 25 minutes proved a bit of a torture test. 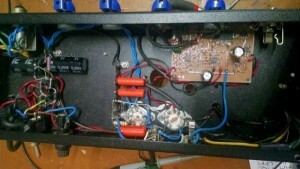 In 2019, I hope to build some guitar amps that exhibit a clean average peak power of 40W or so. I’ll carefully measure my dummy load & update this posting when I’ve got some more temperature data. 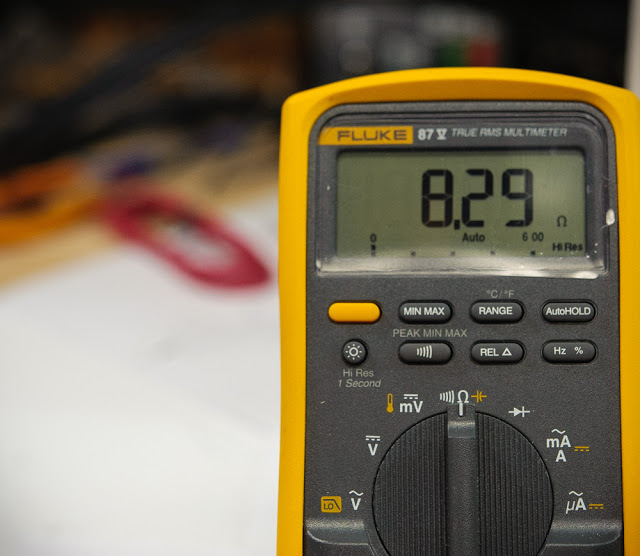 Clearly, if you want to torture test a load driven to 100W measured power, you’ll have to consider increasing the heat sink area, apply more resistors, or perhaps, spawn a correct thermal resistance heat sink design using math and measures. Mine is just a hack — and it operates within spec for my particular resistors and needs. 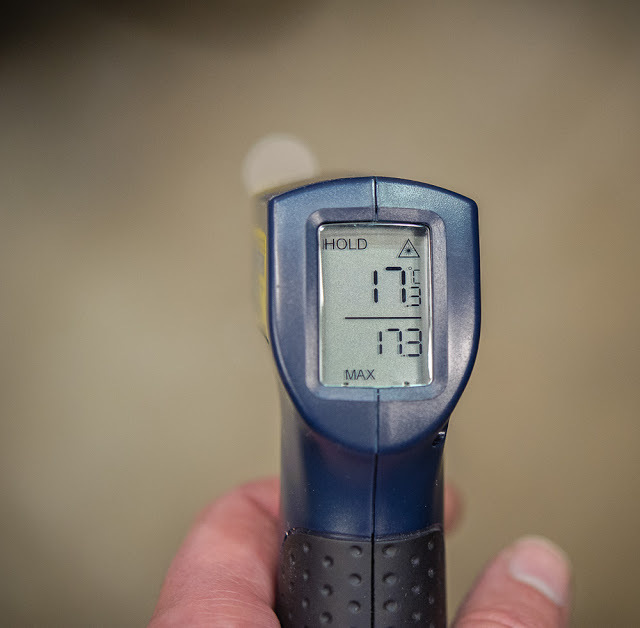 Above — the temperature of my concrete floor. It’s already cold in my lab and we’re barely into the Canadian winter. That’s ~60 F for those who dwell in the USA. 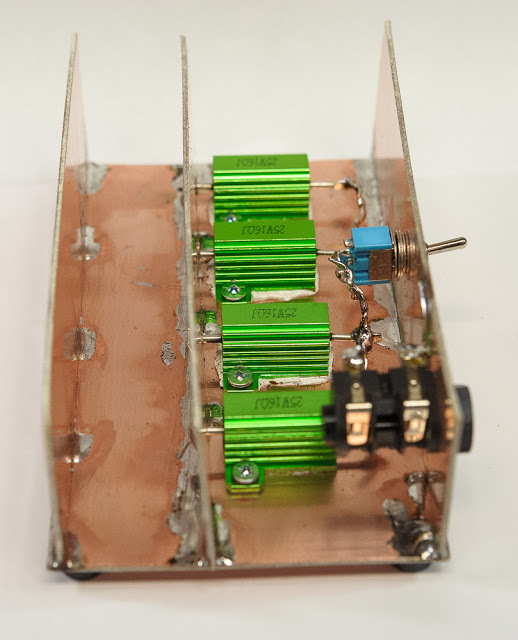 Above — My previous home brew 8 Ω dummy load made sometime in the 1990s. The big resistors are 2W rated 1% tolerance resistors and this worked OK for the AF power amps I built up until the last couple of years. 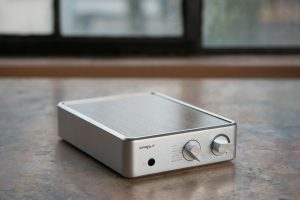 It seem that some people quote a guitar amplifier’s peak versus RMS power etc. This causes confusion. For reference, here is how I calculate the maximum power for all the guitar amps I’ll present over time. 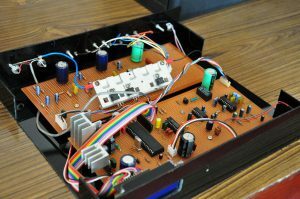 To measure power, we employ a signal generator ( often a 1 KHz sine wave, low distortion signal source ); an amplifier under test that contains a power amp stage; and finally a purely resistive load such as the dummy load I presented. Above — Average power formula. We advance the signal generator gain until distortion appears on the oscilloscope output. 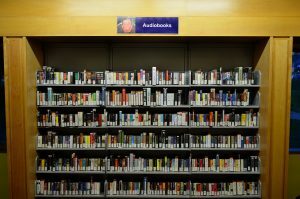 Then we back it off slightly to re-establish an output free of distortion by viewing the sine wave on an oscilloscope; or the sine wave and/or FFT in a digital storage oscilloscope. The oscilloscope peak to peak voltage gets divided by 2 to give the peak voltage. The peak voltage is then squared. 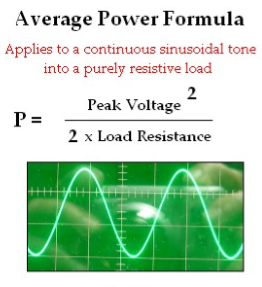 The peak voltage squared is then divided by 2X the load resistance. 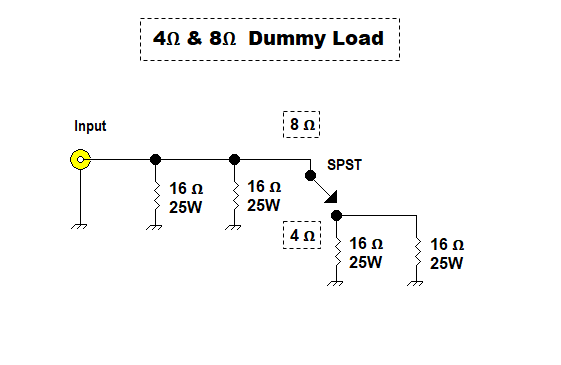 So if the dummy load is set to 8 Ω, we would divide by (2 times 8) which is 16 Ω. For my particular dummy load, I’ll use (2X 4.28 Ω) or (2X 8.29 Ω) for my load resistance.